Morgan Stanley is a global investment bankBulge Bracket Investment BanksBulge Bracket investment banks are the top global investment banks. The list includes companies such as Goldman Sachs, Morgan Stanley, BAML, and JP Morgan. What is a Bulge Bracket Investment Bank and that was founded on September 16, 1935, by Henry Sturgis Morgan and Harold Stanley. 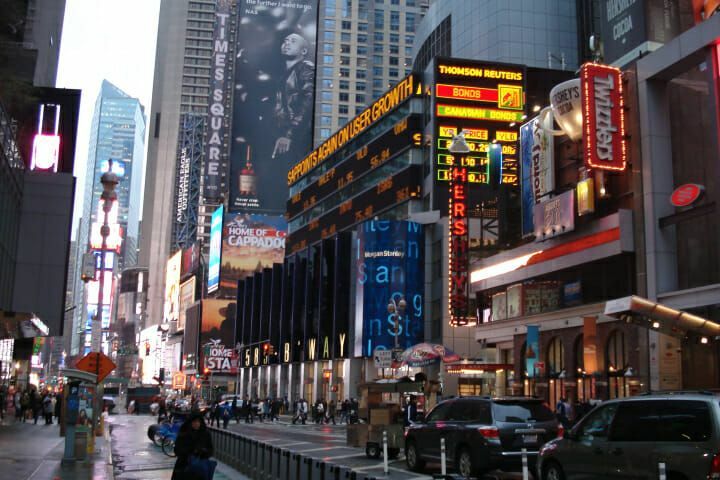 Headquartered in midtown Manhattan, New York City, the company operates in 42 countries globally and employs more than 55,000 staff. It provides investment bankingIBD - Investment Banking DivisionIBD is an acronym for the Investment Banking Division within the overall investment bank. IBD has responsibility for working with corporations, institutions, and governments to carry out capital raising (underwriting in equity, debt, and hybrid markets) as well as for executing mergers and acquisitions, investment management services, securities and wealth managementPrivate Wealth ManagementPrivate wealth management is an investment practice that involves financial planning, tax management, asset protection and other financial services for high net worth individuals (HNWI) or accredited investors. Private wealth managers create a close working relationship with wealthy clients to help build a portfolio that achieves the client’s financial goals. services to individuals, corporationsCorporationWhat is a corporation? A corporation is a legal entity created by individuals, stockholders, or shareholders, with the purpose of operating for profit. The creation involves a legal process called incorporation where legal documents containing the primary purpose of the business, name, and location, financial institutions, and governments. The wealth management division provides various financial services and solutions to individuals, small and medium enterprisesMarket CapitalizationMarket Capitalization (Market Cap) is the most recent market value of a company’s outstanding shares. Market Cap is equal to the current share price multiplied by the number of shares outstanding. The investing community often uses the market capitalization value to rank companies, and institutions. Services offered in this unit include brokerage, credit, investment advisory, wealth planning services, annuity and insurance products, retirement planning services, and managing of fixed income securities. In 2009, Morgan Stanley and Citigroup agreed to combine their wealth management business segments and renamed the new unit Morgan Stanley Smith Barney. Morgan Stanley held a 51% stake, and Citigroup owned a 49% stake in the company. The company was renamed to Morgan Stanley Wealth Management in 2012 after purchasing an additional 14% stake in the unit. Later in 2013, Morgan Stanley received approval from the regulatory authorities to acquire the remaining 35% owned by Citigroup. The investment management segment provides asset management products and services to institutional and retail clients through intermediary channels. Some of the products and services offered by the unit include real estate investment, alternative investments, equity, fixed income, and private equity. Morgan Stanley and Van Kampen brands provided these services until 2009 when the latter was sold to Invesco for $1.5 billion. Morgan Stanley retained the Morgan Stanley brand, which the company uses to provide asset management services to institutional investors such as foundations, university endowment funds, private fundsPrivate Equity FundsPrivate equity funds are pools of capital to be invested in companies that represent an opportunity for a high rate of return. They come with a fixed investment horizon, typically ranging from 4 to 7 years, at which point the PE firm hopes to profitably exit the investment., insurance companies, pension plans, financial institutions, and government agencies. Individual investors receive asset management products and services through third-party distribution channels and intermediaries. The institutional securities segment is one of the company’s most profitable. It provides investment banking, sales and trading, and real estate and corporate lending. The international securities unit services corporations, financial institutions, high net worth clients, and governments. Investment banking may involve capital raising through IPOs, financial advisory on restructuring, mergers, and acquisitions, underwriting of debt, and project financing. Sales and trading involves market-making activities in equity, fixed income products, and foreign exchange. Corporate lending comprises commercial and residential mortgage lending, loans to municipalities and government agencies, as well as financing extended to equities customers. Morgan Stanley was formed as a result of the Glass-Steagall Act that required United States banks to separate their investment banking and commercial banking businesses. It followed the Great Depression when there were a series of bank runs, and commercial banks were accused of taking too many risks using depositors’ funds. When J.P. Morgan chose to continue with commercial banking, some of its employees, notably Henry S. Morgan and Harold Stanley, left the company to start an investment banking company. Morgan Stanley first opened its doors to the public on September 16, 1935, at 2 Wall Street, New York City. In its first year, the company achieved a 24% market share ($1.1 billion) among public offerings and private placements. It was appointed the lead underwriter in the distribution of debentures for the United States Corporation in 1938. In 1941, the company carried out a reorganization to allow it to venture into the securities business. Later in 1942, Morgan Stanley joined the New York Stock Exchange. 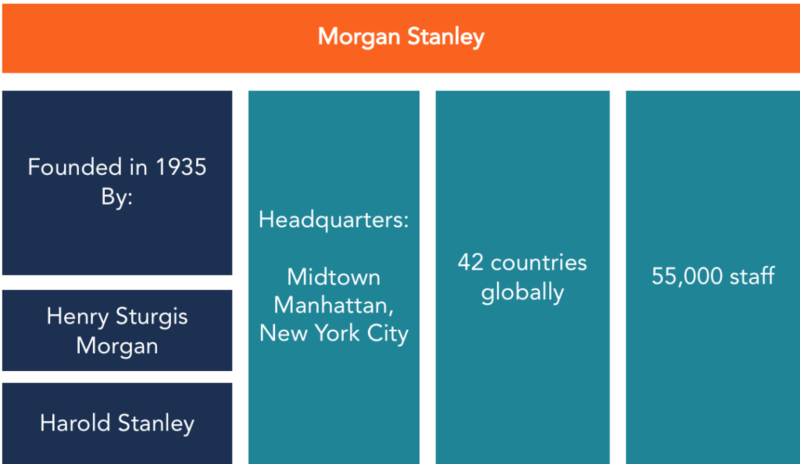 Between 1951 to 1961, Morgan Stanley was involved in a series of public financings. They included co-managing of World Bank’s $50 million AAA-rated bonds, General Motor’s $300 million debt issue, IBM’s $231 million stock offering, and AT & T’s $250 million debt offering. In later years, the company also served as an underwriter in some of the largest tech IPOs, including Netscape, Cisco, Broadcom, VeriSign, Groupon, Salesforce, Priceline, Compaq, and Google. During the financial crisis, Morgan Stanley reportedly lost 80% of its market value between 2007 and 2008. To survive the crisis, the firm received capital infusions from several entities. In December 2007, the China Investment Corporation injected $5 billion into the company in exchange for securities that would be converted to a 9.9% equity in 2010. In September 2008, Morgan Stanley received $9 billion from Mitsubishi UFJ Financial Group, Japan’s largest bank. The US Treasury made $10 billion in equity investments into Morgan Stanley as part of the $700 billion government bailout for troubled financial institutions. The company also borrowed $107.3 billion from the Federal Reserve to help it finance its cash-starved operations. James P. Gorman is the Chairman and Chief Executive Officer of Morgan Stanley. He joined the company in 2006 as the President and Chief Operating Officer of the Wealth Management Group. Gorman also served as the co-president and co-head of strategic planning at the company. He earned a Bachelor of Law from the University of Melbourne. Gorman also holds a Master of Business Administration from the Columbia Business School. He received a salary of $22.5 million in 2016. Colm Kelleher is the President. He previously served as the Executive Vice- President (2007-2016), President of Institutional Securities (2013-2016), Co-President of Institutional Securities (2010-2012), and Chief Financial Officer and Co-Head of Strategic Planning (2007-2009). Henry Sturgis Morgan Sr. was an American banker, and he co-founded Morgan Stanley after the Glass Steagall Act forced J.P. Morgan & Co to separate its investment banking and commercial banking divisions. He joined J.P. Morgan in 1923 after he graduated from Harvard University. His grandfather, J.P. Morgan, founded J.P. Morgan & Co. Henry S. Morgan Sr. died on February 8, 1982, at 82 years old. Harold Stanley was an American businessman who co-founded Morgan Stanley in 1935. He led the reorganization of the company in 1941 from a corporation into a partnership. Stanley became popular in the investments industry while at J.P. Morgan for his expertise in securities trading. He died on May 14, 1963, at 77 years old.